Like lions, tigers and domestic house cats, cougars and bobcats are members of the family Felidae. Though they share some physical similarities and have some overlap of habitat, they have interesting differences as well. Both animals are known by multiple names. The cougar (scientific name Puma concolor) is also commonly known as a puma or mountain lion. 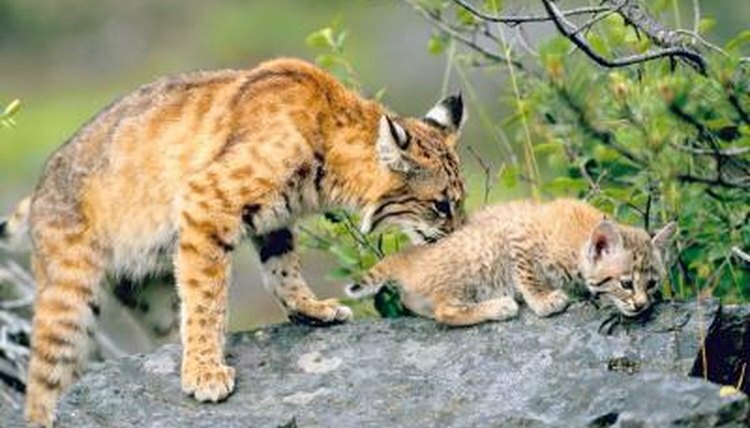 The bobcat (Lynx rufus), a cousin of the lynx, is sometimes called a wildcat. Cougars and bobcats are most easily distinguished by their size. Cougars are considered large cats, with bodies 5 to 6 feet in length including their long tails. These cats average about 135 pounds and can weigh up to 180 pounds. Bobcats are mid-sized cats measuring just 2 to 3.5 feet long and weighing up to 40 pounds, about twice the size of a domestic cat. Their size distinction is clearly recognizable in their tails, as the cougar can have a 2.5- to 3.5-foot tail, while the bobcat has just a 6-inch tail. The bobcat is named for its short tail, which appears bobbed. The coloration of cougars and bobcats is similar, with both exhibiting a tawny or brown-colored coat. The cougar’s coat, however, is a solid hue while the bobcat is more mottled or spotted. Both cats share black tips on their ears and tails, though the bobcat has pointed ears and ear tufts, compared to the cougar’s rounded ears. Young cougars and bobcats both exhibit spotted coats, though cougars’ spots fade in their first year of life. Cougars and bobcats, like all species of cats, are carnivores. Both cougars and bobcats are considered generalist carnivores, meaning they eat meat from a variety of animals depending on availability in their home ranges. Cougars’ preference is for deer, but they'll eat smaller mammals including raccoons and coyotes. Bobcats can hunt large animals like deer, but typically prey on smaller options such as rabbits, squirrels, birds and even reptiles. North America has vast ranges of both cougars and bobcats. The cougar’s North American range extends from western Canada through the western half of the United States and Mexico, then south through Central America and most of South America. The bobcat’s range is solely within North America, but spans both coasts of the United States, most of Mexico and some of southern Canada. Both animals lead solitary lives with specific home ranges and can thrive in a variety of habitats including forests and swamps. E. Anne Hunter has more than a decade of experience in education, with a focus on visual design and instructional technology. She holds a master's degree in education. Hunter has contributed to several professional publications, covering education, design, music and fitness, among other topics. What Weasels Live in the Wild in Oregon? What's the Difference Between a Jaguar & an Ocelot? What Do a Lion & Tiger Have in Common? What Are Ermines & Mink? What Are the Differences Between a Cougar & a Cheetah?